Cardiomyopathy refers to a progressive disease of the heart muscle or myocardium. According to EMedicineHealth.com, cardiomyopathy usually results in the myocardium weakening to a point where it’s no longer able to adequately pump blood to the rest of the body. 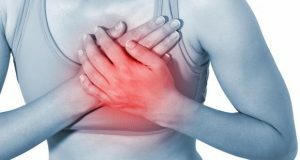 As the heart grows weaker, it becomes more susceptible to other complications like heart valve problems or heart failure. Dilated cardiomyopathy (DCM) — The most common type of cardiomyopathy, DCM affects the ventricles and atria, or the lower and upper chambers of the heart. This condition causes the heart muscles to dilate and thin, which then leads to the heart chambers expanding. DCM can be inherited or brought about by coronary artery disease. Hypertrophic cardiomyopathy (HCM) — Another common form of cardiomyopathy, HCM arises when heart muscle cells enlarge and thicken the walls of the ventricles. Blood is then unable to flow through the heart, which can then raise blood pressure or increase the risk of arrhythmia or irregular heartbeat. Restrictive cardiomyopathy — An uncommon type of cardiomyopathy. Restrictive cardiomyopathy occurs when the ventricles become rigid and restrict blood flow in the heart. The scarring of heart tissue is a frequent cause of restrictive cardiomyopath. Arrhythmogenic right ventricular dysplasia (ARVD) — Although rare, ARVD is the top cause of sudden death among young athletes. This condition develops when the muscle tissue of the right ventricle dies and is replaced by scar tissue. In general, cardiomyopathy affects the heart. Several parts or one part of the heart can be harmed, depending on the form of cardiomyopathy. For instance, ARVD primarily impacts the right ventricle, while HCM damages the ventricles and heart chambers. Treating cardiomyopathy largely depends on its severity and the symptoms. For example, a person may be prescribed beta blockers or ACE inhibitors to lower their blood pressure, or given blood thinners to prevent the formation of blood clots. Surgery may be required in some cases, specifically septal myectomy (usually for obstructive HCM) and surgery for the implantation of heart devices like pacemakers or cardiac resynchronization therapy devices. Heart transplants are saved as the last resort. Another aspect of caring for people with cardiomyopathy is helping them manage the symptoms. This is usually done through lifestyle changes. On top of sticking to a heart-healthy diet, one should increase their physical activity and reduce stress as well. Getting enough sleep and rest, quitting smoking, and avoiding illegal drugs can all improve a person’s heart health by a considerable margin. Cardiomyopathy is a heart disease that affects the heart. Although are numerous types of cardiomyopathy, the symptoms are more or less the same across the board. These symptoms fatigue, high blood pressure, dizziness, and chest pain. Often times these symptoms won’t manifest until the disease has worsened. Any person can be affected by cardiomyopathy, which is either inherited or acquired. Treating this disease usually means prescribing various types of medication or undergoing surgery. Cardiomyopathy can’t be fully prevented, but it can be managed through significant lifestyle changes like eating more heart-healthy foods, exercising more frequently, limiting alcohol consumption, and reducing stress.